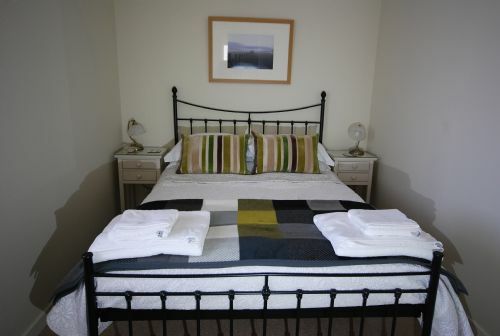 Seil is a generous cottage sleeping 2 people in one double room. 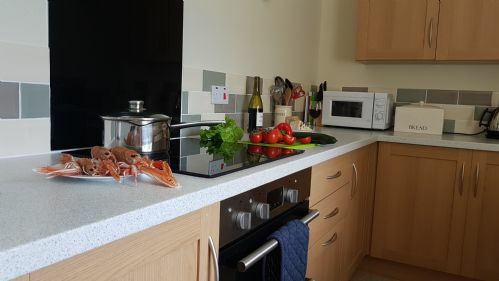 There is a very spacious open plan lounge/diner/kitchen with wood burning stove and a fully equipped kitchen with ceramic hob and double oven, microwave, washing machine and tumble drier, dishwasher and fridge-freezer. There is a cottage bench outside the door looking out to the hills, and picnic bench in the walled cottage garden to the rear. Maximum 2 dogs accepted. 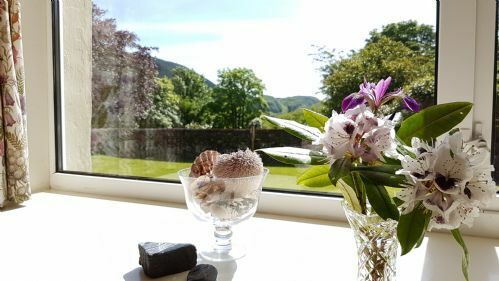 Our stay at Seil Cottage was everything I had hoped it would be. The cottage was clean and comfortable and we were greeted with fresh flowers and home made biscuits. The stove was laid and ready to light and a basket of logs was provided. Views over the garden and Loch Seil were beautiful. Thank you for your review and the lovely positive comments. We're pleased you enjoyed your stay with us. We really enjoyed our stay in Seil Cottage. The welcome packs for people and dogs were lovely. Great to be able to make a cup of tea straight away! The cottage was clean and comfortable and we enjoyed the log burner, even though it wasn't really that cold. It was helpful to have a fenced garden for the dogs. The location is really good for exploring the local area and further afield. There is so much to do and there was plenty of information available in the cottage. The smaller islands are lovely and easy to visit but there are also lovely day trips. We went to Mull and Glencoe, both of which were easily manageable in a day. Highly recommended - I hope we can come back. Thanks for your comments, great that you had a good holiday and enjoyed your stay with us and also the surrounding area. It would be lovely to see you back again. Excellent dog friendly cottage five star accommodation and location. If you are looking for a dog friendly cottage in a wonderful peaceful location in Scotland look no further. The cottage was spotless. The welcoming dog basket with treats and bowls and blankets for the dogs was a great touch. Our hosts could not have been more welcoming. They were very kind especially as they gave us some boots for one of our very elderly Spaniels who had a foot problem,which made her stay so much easier. They have a vast local knowledge of the area and what there is to do and where to do it ,which was very helpful and made our stay even more memorable. 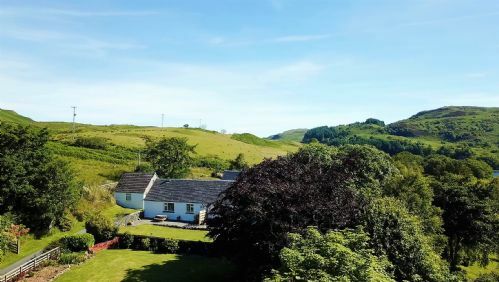 The locality of Seil cottages is such that you have the busy town of Oban only twenty minutes away and access to all the beautiful Scottish Islands.If you don't want to venture to far there are great well planed walks from the cottages one even goes to a secluded beach that the dogs loved. Anne and Mike were fantastic hosts and I would thoroughly recommend Seil cottages if you are looking for dog friendly accommodation where there is a relaxed atmosphere and incredible peaceful surroundings. You can unwind and relax and if your dogs could talk I am sure they would ask to go back and visit again. Hi, thanks for the lovely review comments. It was great having you here and we're so glad the dogs enjoyed it too, especially little Tilly, we were happy to be of service! Hope to see you all again soon. Beautifully presented cottage clean and well equipped. Lovely hosts very knowledgable of the area. Very dog friendly. Hi, thank you for staying with us and for your positive review comments. Hope to see you again! We stayed here for 4 nights with our dog and had a great time. There are lots of options for walks/trips in the area and it is ideally placed for a day trip to Mull. The accommodation is comfortable, very clean, with a well stocked kitchen. Our dog was well looked after with her own hamper containing treats, towel, bowl etc. I would definitely recommend! Thanks for taking time to review us and for the lovely feedback. Glad you enjoyed your stay and hope to see you again. A perfect cottage in a perfect location. This was the first time l had visited this beautiful area. The cottage is of an excellent standard. Anne, the owner was extremely helpful and very friendly. The weather was exceptional and l made the most of it. Shane, my yellow ladbrador who was with me was having a great time. He was swimming in the water at Seil Island. All in all we had a superb break at Seil Cottage. I may well return at some point. Thank you for your review. We're glad you and Shane enjoyed the cottage and the area, and we hope to see you again sometime. We had a lovely few days in Seil cottage and were lucky enough to enjoy a lot of sunshine. The cottage has everything you could need, is clean and modern and Anne & Mike are extremely helpful on advising on the local area and amenities. I never realised how beautiful the whole area is and must look stunning throughout the different seasons so we'd like to return when we can. Thank you for your positive review comments, we're glad you enjoyed your visit and look forward to welcoming you back. We stayed for 5 nights at Loch Seil Cottage. We found the location perfect for us , it was placed in a countryside location but was easily accessible by car to Oban and to numerous local attractions. There are also many lovely walks from the cottage itself which reward you for your effort with amazing views. The cottage was equipped to a high standard with everything you could possibly need and was stylish and welcoming in it's design. Ann and Mike were great hosts and readily shared their varied of knowledge relating to the area . This cottage is in an ideal location for exploring the local area on all levels- by car, cycle or foot. Thanks for your positive comments and taking the time to write a review. We're glad you were pleased with the cottage as well as the location. A wonderful experiance. Warm and friendly welcome, everything in the cottage you could ever want. We had a wonderful stay and will highly recommend. Thanks so much too for the offer of additionl nights due to weather conditions. We would love to return. Hi, thanks for the review. We're glad to know you got home safely in all that snow! Spent a lovely weekend at loch aril cottage . The cottage itself had everything you need for a self catering cottage , the welcome pack was very much appreciated as was the dog treats for our dogs , for dog owners and walkers lots of good walks nearby , for shoppers Oban is only a short drive . Hi, thank you for taking the time to review us, glad you and the dogs enjoyed your stay. A lovely cottage maintained to a high standard and which is very well equipped. The proprietor's are very friendly and helpful and there were nice touches such as a welcoming plate of home mad shortbread. Hi, thanks for the review, we are pleased you enjoyed your stay with us. Seil cottage is a high quality, superbly equipped cottage. The location is perfect for a rural get-away while still being close enough to local amenities. The gardens are beautiful. The local views and walks are truly breathtaking. The proprietors, Anne & Mike, are so thoughtful, they will have thought of things that you won't have - down to a welcome pack for your dog. Loch Seil Cottages are a very safe bet for a stay on the West Coast of Scotland. Thank you for your review, so glad you enjoyed your holiday with us. We were met by our hosts, who led us too our cottage for the next 4 nights. Hi Paul, thanks for the great review. So glad you liked the home made shortbread biscuits! The log fire is definitely an asset on chilly autumn days. Wonderful location. Easy to find and great base for exploring the area. Nice touch coming back and putting a fire on as its usually cold at night in scotland. Thank you for your review. We're pleased you enjoyed your stay, especially the wood burner, it does make it really cosy. Amazing journey from the cottage ( every thing you need) on road, rail or sea to journey on this amazing geographical and historic land. Super food too. Oban fish..,. Wow.you will return .. Thank you for your review. There is certainly a lot to see and do around here! Fantastic location for touring Argyll and surrounding areas. So much to do from outdoor pursuits to historical standing stones and burial mounds. 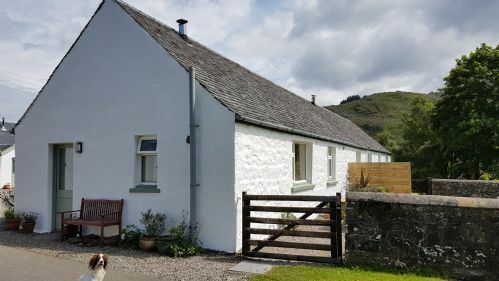 Seil Cottage is superb, furnished to a high standard and equipped with everything you need for your convenience and comfort. There is a beautiful enclosed garden with wonderful views which is safe for our four legged family members. A very special place which we are already planning to return to. Thank you for your review and lovely comments, we are so glad you liked the Cottage and the area, and we look forward to welcoming you back again. Loch Seil Cottage is situated in a beautiful location, ideal for exploring the islands and areas around Oban. The owners Mike and Ann were very welcoming providing little extras for our stay. They provided lots of information on places to visit and things to do. The cottage is very modern, fresh and had not long been refurbished , it had everything we needed for our stay. Very comfortable and beautiful little cottage, we thoroughly recommend. Thanks for your comments and we are really pleased you enjoyed your stay with us. Mike and Anne have renovated the cottage with love, so we spent 8 pleasant days at Loch Seil Cottage. The state of the furnishings and the equipment are new and we didn't miss anything. Hi, thanks for your comments, it was lovely having you here and glad you enjoyed your stay. Hope to see you again! Everything was perfect, the attention to detail was fantastic, everything you needed was there, even doggy treats. So much information about the area. I can honestly say it was perfect place to stay. A peaceful and comfortable stay. We feel refreshed and rested. Our stay was delightful. The cottage was so comfortable and well equipped that we enjoyed being there as much as we enjoyed the lovely scenery. Polly,our dog loved being there too and there were lovely forest, hill and coast walks nearby. Thank you for your comments, we're so glad you and Polly enjoyed your stay and walks. The cottage is in a very peaceful location and was very well appointed. Perfect for two. Within easy reach of Oban for shops and main facilities as well as other quieter local attractions. Thank you for your comments and taking the time to review us. Feedback is always appreciated. Lovely cottage at a great location, recently renovated it has a high standard and is well equipped. Welcome pack and informationleaflets areprovided including ideas for local walks directly from the cottage or on the nearby slate islands. The location is very quiet. Thanks for the comments and for taking the time to review us. Glad you enjoyed your break. What a lovely location for a retreat, but still in easy reach of Oban, Mull, Loch Lomond and many other lovely Sottish treasures. The cottage was fully equiped with everything possibly needed as well as allowing the dog to come on holiday with us! Modern facilities, warm and clean and stunning walks with views round the cottage. The Grabhams were helpful and welcoming. Hi David, thank you for your kind comments. We are glad you enjoyed your stay. It would be useful if wi fi was available in the cottage. Hi Dave, thanks for your comment. We are currently looking into ways to provide WiFi in the cottages. In the meantime, we hope that the option to use the house WiFi is of some use. A lovely spot and the cottage provides everything one could need ( except mobile connection & wifi- latter is in the main house) For us this was in many respects an asset and contributed to the peace and quiet, get-away -from-it-all atmosphere. We had never been to the Seil islands and very much enjoyed exploring them. For me, personally there could have been a problem with the dogs as I am afraid of them, but the owners were most considerate about keeping their lovely dogs away from me. Many ,many thanks! The cottage had every utensil, every piece of cutlery or crockery one might need and many we didn't. Everything was provided- down to toilet paper. washing up stuff- everything. We did not try out the Tesco delivery for purchases because we had brought most things we needed and there is a lovely little store at Balvicar. We hope to go again. An excellent and comfortable property with all modern appliances in a stunning quiet location in easy access to the main town of Oban. Beautiful drives and picturesque scenery. The owner's are extremely helpful and can give you advice on what to do around the area during your stay. Would highly recommend this to anyone looking for a quiet break.